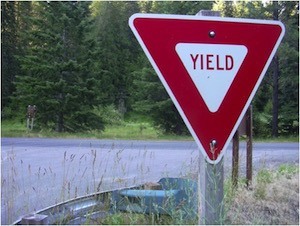 The failure to yield plays a significant role in many car accidents. Miami car accident attorneys see people who are injured in these accidents every day. Unlike some types of car accidents like rear-end crashes in which fault is usually clear, failure to yield car accidents in Miami are usually disputed. That is why it is important to know what to do after a Miami car accident and to consult with a Miami car accident lawyer as soon as possible. Any driver who enters a public roadway that is not governed by traffic control devices must yield the right of way to oncoming traffic. If two vehicles come into an intersection from different roads at the same time, the driver on the left must yield the right-of-way to driver on the right. Drivers should yield to buses that have signaled and is entering traffic heading in the same direction. If the driver is properly notified of workers and flag persons working on a roadway or construction site, they should yield the right-of-way to the pedestrians. Where a driver is governed by a yield sign, the driver is required to slow down to a reasonable speed and even stop if necessary and yield to pedestrians or oncoming traffic. The Miami car accident attorneys at the Wolfson Law Firm have represented personal injury victims since 1963. Our injury and accident lawyers serving Miami can represent you and your family from the first moment you contact us through settlement or jury verdict and award. We will even handle appeals if necessary. Once we have gathered the evidence, we will prepare a settlement demand to the responsible driver’s insurance company. We will present your case in a compelling and professional manner. Our Miami personal injury lawyers will set a reasonable time for the insurance company to respond to our demand. If the insurance company fails to respond in a timely manner or refuses to make a reasonable offer to settle, our Miami car accident lawyers will not hesitate to file a lawsuit on your behalf. After your Miami car accident lawsuit is filed, our car accident attorneys in Miami will ask for a trial date on the first available setting. Once your case is set for trial, the court will order the parties to go to mediation which is a settlement conference with a neutral third party. We will go with you to the court ordered mediation and make your case once again. A majority of cases resolve at mediation. If your case does not settle for a reasonable amount our Miami car accident attorneys will prepare you and your case for a jury trial. No matter what, we will see your case through and stand by your side. The Miami car accident attorneys and personal injury lawyers at the Wolfson Law Firm are available to represent you and your family. All you need to do is call us at (305) 285-1115 and let us get to work for you. The Wolfson Law Firm in Miami serves the communities and neighborhoods of South Florida including Homestead, North Miami Beach, Florida City, Aventura, Kendall, Edgewater, Miami Beach, Liberty City, West Flagler, Westchester, Key Biscayne, Doral, Weston, Pembroke Pines, Fort Lauderdale and Hollywood.